Above, a look in the hangar. Notice nothing was left on the floor. 1-26 fuselage is hanging from the roof trusses, the wings are on the back porch. Gliders are designed to have the wings removed in a few minutes. Keep in mind that none of the inventory lives here, it is all high and dry on shelves at SPA/Panther, so there is no interruption in shipping of parts, no matter how ‘humid’ my hangar is. Above, the workshop. It sits about 2″ lower than the hangar. It is insulated and cooled and heated, but the insulation stops 3′ from the floor so it doesn’t get soaked in a flood. 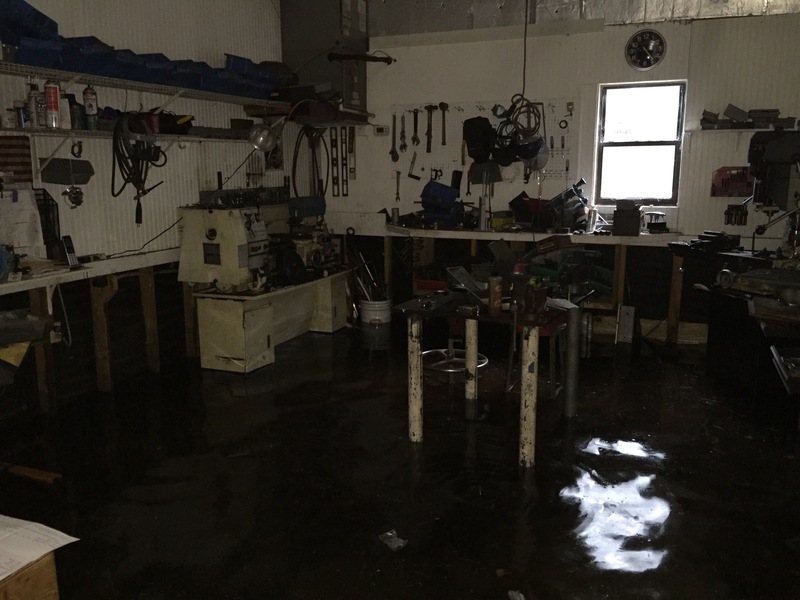 In the ten and a half years we have been here, the shop has flooded eight or nine times. The typical interruption to work is 3 or 4 days. The most effective solution would be to replace the shop and the hangar with a modern building sitting on a new slab 24″ higher, but that is a pretty expensive sentence, not mathematically supported by the last decades real estate values, nor working to supply the most economical engine on the market, while staying true to Why “Made in America” matters to me. If I didn’t like what I do, having the nicest shop wouldn’t make me happy: Equally, if you believe in what you do, then a less than perfect facility, is an occasional annoyance, but not a road block. 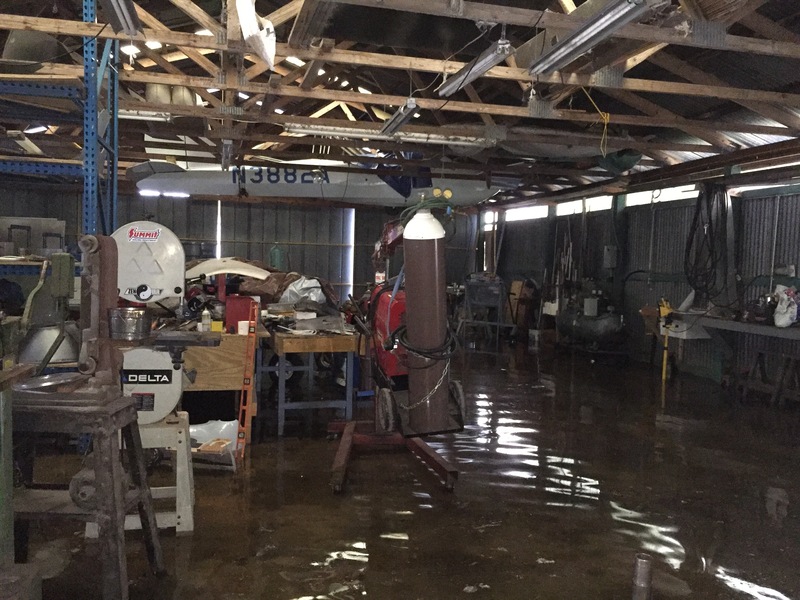 A lot of homebuilt planes are finished in basements and garages by motivated builders, while a greater number sit in spotless hangars, never worked on. For a look at what the yard looks like in a big storm, check out: Let It Not Rain. In 1967, one of the projects my father was working on in Vietnam was dredging the port facilities Cam Ranh Bay. The US Government had allowed contractors from SEATO nations to bid the job. The Asian company that got the contract had to tow the dredge hundreds of miles to bring it to the site. When it was late, my father sternly asked for an explanation, and true to the old eastern custom of not loosing face or directly addressing issues, he was told the delay was caused by “Excessive humidity in the engine compartment.” A nice message, but the US Navy sent word the dredge was at the bottom of the South China Sea, having already sunk in route. I’m glad that the humidity in your hangar and workshop weren’t too excessive. In Florida we do not have rain, it is actually “Liquid Sunshine” or so the Chamber of Commerce likes to say. I am not sure how things are in your part of the state William but up on the Florida Pan Handle where my family lives, any hole dug more then 2′ down hits water. Given that situation the yard gets watered with the output of a well that is only 25′ deep. With that kind of water table it takes a long time for Excessive Humidity to find a place to go. Glad to see you were prepared and everything of value was up off the floor – Especially that 1-26. We 1-26 pilots need to stick together! the best way to describe living in Saint Augustine during this hurricane is “HIGH PUCKER FACTOR” ! I told you I’d come down and sweep the shop. I can learn how to use a squeegee too! Love the welder lift. I have one just like it! Hope all is spared and ya’ll are OK! My brother rode out the storm in Vero Beach with friends in a fortified house. They never lost power.